“Great to be in Winnipeg in the summer,” joked Jim Cuddy from the stage, and indeed it felt like shirtsleeves weather coming in from the airport as this beautiful and improbably persistent autumn lingers. Our destination was the huge and sprawncy, brand new South Building of Winnipeg’s Convention Centre, made extra-glamorous for our GMP gala. Scott Russell was again our wise and witty emcee; the band was almost an orchestra with Jim Cuddy joined by Ed Robertson, Alan Doyle, Barney Bentall, Geoffrey Kelly and Matthew Harder from Spirit of the West and Rebecca Harder on accordion. Together they gave us some of the best music of the entire campaign. Our chefs were equally creative, sending a litany of pleasures to the judging table where seven of us sat in state, led by our Senior Judge in Winnipeg, chef, restaurateur and nationally recognised baker and culinarian, Barbara O’Hara. Judging with us were award-winning writer and broadcaster, Arvel Gray; writer, critic and co-author of The Manitoba Book of Everything, Christine Hanlon; culinary mentor and Executive Chef of the Fort Garry hotel, Joseph Wojakowski; food writer, broadcaster and main man at Peg City Grub, Mike Green; and last year’s gold medallist, chef Norm Pastorin of The Cornerstone. Once again the marks were incredibly close between silver and bronze – just half a percentage point separating two dishes that both tasted and smelt absolutely delicious as well as being pretty as a picture. Barry Saunders of Inn at the Forks and Era Bistro & Catering won the bronze medal. He began with lamb belly, curing it like bacon for 48 hours then cooking it sous vide before roasting it off. The succulent meat had a delightful crust and layers of unctuous, fragrant fat that tamed the tannins in Chef’s chosen wine, the Family Estate Reserve Shiraz from Mission Hill in the Okanagan. The dish’s tight, beautiful plating involved a silky celeriac purée tucked under the meat and an aromatic fig and rosemary glaze on top of it. Pickled mustard seeds spilled off the lamb onto the plate while three scarlet dabs of capsicum purée were powerhouse moments of roasted red pepper flavour. 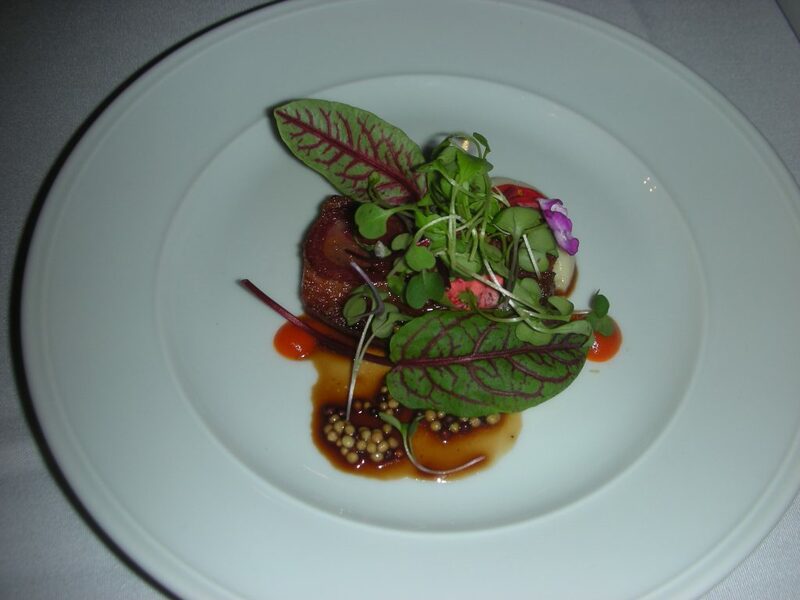 Two sorrel leaves garnished the creation like jaunty feathers and a final touch of seedlings and edible flowers brought freshness and colour. 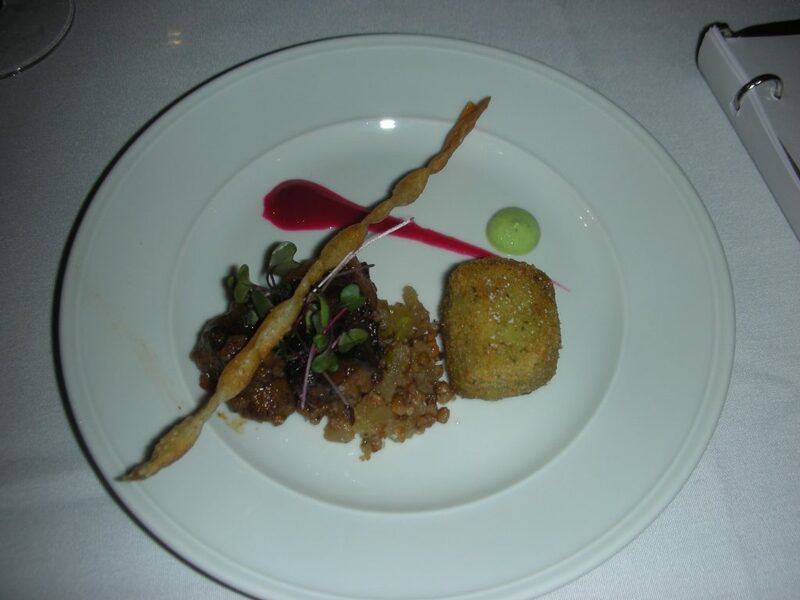 Melissa Makarenko of Resto Gare Bistro & Train Bar took the silver medal with a trio of treatments of local wild boar. The belly was a wicked treat, glazed with a vanilla-scented honey, melting where it needed yo be melting, crusted on the surface, the leaner meat full of porky flavour. Beside it was a piece of slow-braised pork cheek, rich and savoury with a gratifyingly different texture to the belly. Both pieces of meet shared a pillow of pilaf made from buckwheat and golden beet brunoise. The third piggy component was a cromesquis, a hollow fritter filled with a hot, juicy mixture of trotter and finely chopped honey mushroom that erupted onto the pilaf. Two sauces kept their distance on the other side of the plate but brought a leavening freshness to the rich meats – a comma of tangy borscht gastrique and a teaspoonful of dill crème fraîche. Lying across all this was a crisp ribbon of very fine buckwheat tuile. Chef Makarenko’s wine match was brave and brilliant; where a red might be expected, she chose a big-bodied, fragrant, complex white wine, Closson Chase Chardonnay from Prince Edward County. Chef chose to decant it to bring the temperature up a little, allowing the wine’s oaky fruit and long finish the best possible expression and letting it play nicely with the pork and mushroom components on the plate. Who won the gold? Past-medallist Jesse Friesen of Pizzeria Gusto. 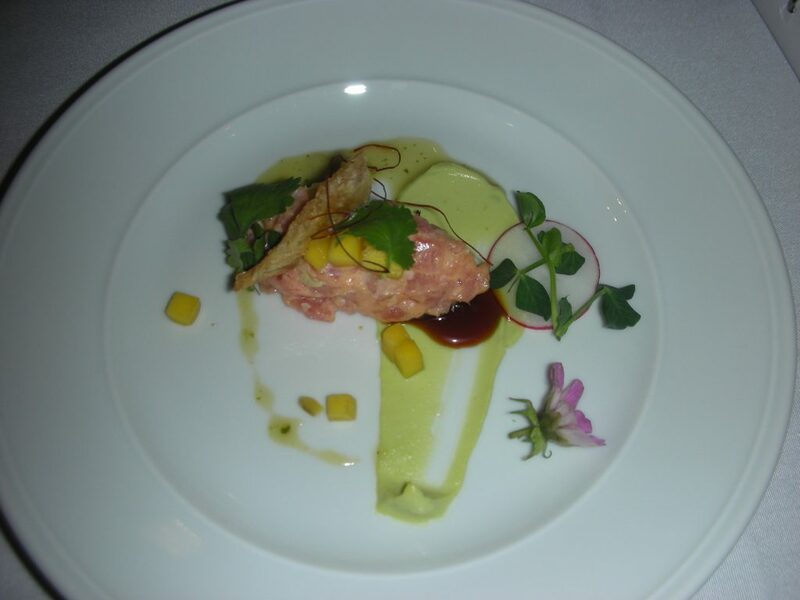 He made a tartare of impeccably fresh, OceanWise-approved yellowfin tuna, seasoning the finely chopped fish with a chili aïoli, lime juice, Maldon salt, green onion and a hint of coriander leaf. A cracker made of turkey skin deep-fried like a lightweight chicherone could be used as a spoon for the tartare but it was too tasty not to eat immediately. Subtly boosting the umami level, Chef placed a spoonful of unagi sauce under the tuna. A stripe of delicate avocado mousse added to the overall richness of the dish while a brunoise of mango lightly pickled in cider vinegar, chili, sugar and anise balanced the effect with a refreshing tang. The last component was a spicy chili oil, surprising some of us with its bold heat, and a garnish of coriander leaves, edible flowers and hair-like chili threads. Again the wine match was most impressive – the slightly off-dry 2012 Riesling from Thirty Bench in Niagara bringing mature petrol notes and peachy citrus to the party. 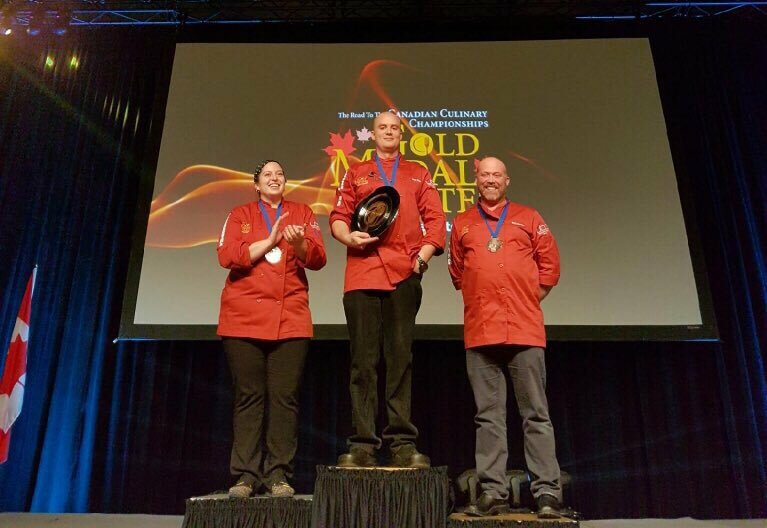 Congratulations are due to all the competing chefs but especially to Chef Friesen who will be joining us in Kelowna next February. And that leaves only one city to visit and one last champion to find in order to complete our roster – Victoria awaits us next week.